RECEIVE UPDATES ON OUR RANGERS' EFFORTS IN EAST AFRICA! Just like you, our rangers work hard. Their jobs are dangerous and challenging, but also fascinating, and they consistently deliver life-saving results. We invite you to stay up to date on our rangers' tireless efforts to protect elephants, rhinos, and lions across the Greater Amboseli ecosystem. Perhaps you'll invite a friend to do the same! Go to biglife.org and sign up for our e-newsletter. Stop the killing of elephants and rhinos! 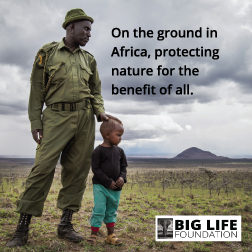 Using highly effective and innovative anti-poaching conservation strategies, Big Life Foundation protects East Africa's wildlife and wild lands. 6am - A ranger wakes at a remote outpost where he serves for 3 weeks at a stretch with a unit of 4-12 rangers. He drinks a cup of hot, sweet tea before setting out on patrol. 9am - The ranger's unit encounters a herd of elephants and notices that one elephant is dragging a leg, suffering from multiple spear wounds. A mobile vet team is called to the scene. The rangers stay with the wounded elephant until it has been treated, revived, and rejoined its family. 1pm - A ranger finds and destroys a deadly snare intended to kill one of the critically-endangered Eastern black rhinos under his unit's 24-hour protection. Another ranger collects data from a nearby camera trap for later analysis. 3pm - The rangers play a game of hide-and-seek in a tracker dog drill designed to keep skills and senses well-honed. The dogs have an incredible sense of smell and easily find them every time. 7pm - Someone reports a baby elephant trapped in a water hole. The rangers rush to pull the baby out of the hole, then deliver it into the hands of caregivers for medical attention. 11pm - No rest for the weary. Rangers respond to a call for help as elephants invade the crops of a nearby community farm. It's no easy task convincing a hungry elephant that this corn was not grown for him, but that's exactly what the rangers must do in order to prevent deadly retaliation. 1am - Finally, sleep. In the morning, with your support, they will rise and start the cycle all over again.